Journey into myth and madness this Spring. Ninja Theory’s multiple award-winning action adventure game, Hellblade: Senua’s Sacrifice is coming to Nintendo Switch this Spring. Hellblade: Senua’s Sacrifice was heavily inspired by Norse mythology and follows the Pict warrior, Senua. Set in the Viking age, players unravel the story of this broken Celtic warrior on a haunting quest to rescue the soul of her dead lover. Following its release in 2017 on PC and PS4, Hellblade: Senua’s Sacrifice was widely praised for its depiction of psychosis. 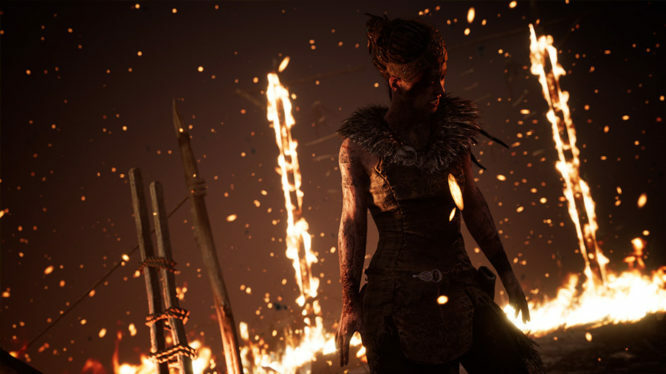 The team at Ninja Theory worked closely with neuroscientists and those who are unfortunate to experience psychosis to ensure Senua’s story and portrayal was accurate. As mentioned, Hellblade: Senua’s Sacrifice has received multiple awards and accolades. These include the BAFTA for Best Game as well The Game Awards for Best Audio Design, Games for Impact and Best Performance. Ninja Theory is, of course, the team behind games such as DmC: Devil May Cry, Enslaved: Odyssey to the West, and Heavenly Sword. Recently, the studio was purchased by Microsoft and brought under the Xbox Game Studios umbrella and it’s not clear if future games from Ninja Theory will be exclusive to Microsoft’s platforms. The announcement was made during the recent Nintendo Direct and can be seen at 29:20 in the video embedded below.